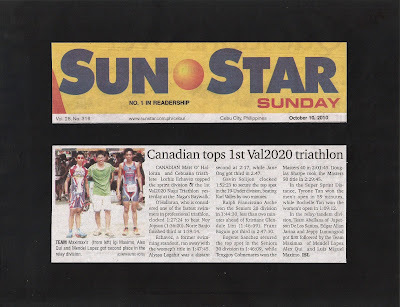 CANADIAN Matt O’ Halloran and Cebuana triathlete Lorhiz Echavez topped the sprint division of the 1st Val2020 Naga Triathlon yesterday at the Naga’s Baywalk. O’Halloran, who is considered one of the fastest swimmers in professional triathlon, clocked 1:27:24 to beat Noy Jopson (1:36:20). Norte Banjo finished third at 1:39:14. Echavez, a former swimming standout, ran away with the women’s title in 1:47:45. Alyssa Lagahit was a distant second at 2:17, while Jane Ong got third in 2:47. 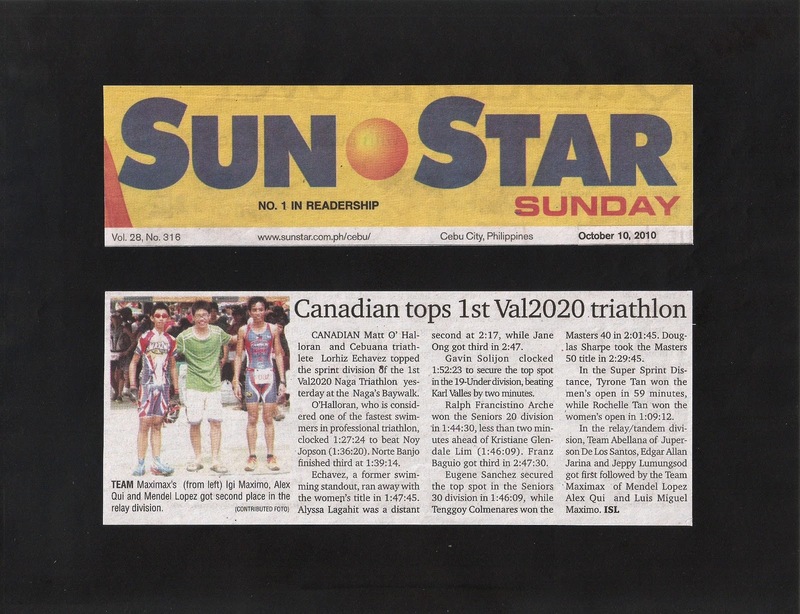 Gavin Solijon clocked 1:52:23 to secure the top spot in the 19-Under division, beating Karl Valles by two minutes. Ralph Francistino Arche won the Seniors 20 division in 1:44:30, less than two minutes ahead of Kristiane Glendale Lim (1:46:09). Franz Baguio got third in 2:47:30. Eugene Sanchez secured the top spot in the Seniors 30 division in 1:46:09, while Tenggoy Colmenares won the Masters 40 in 2:01:45. Douglas Sharpe took the Masters 50 title in 2:29:45. In the Super Sprint Distance, Tyrone Tan won the men’s open in 59 minutes, while Rochelle Tan won the women’s open in 1:09:12. In the relay/tandem division, Team Abellana of Juperson De Los Santos, Edgar Allan Jarina and Jeppy Lumungsod got first followed by the Team Maximax of Mendel Lopez Alex Qui and Luis Miguel Maximo.